Dreamworks Animation has released six new clips from Megamind, starring the voice talents of Brad Pitt, Will Ferrell and Tina Fey. The animated sci-fi action comedy opens on November 5th. Check out the clips after the jump, along with a full synopsis, and see all of our Megamind trailers in the gallery! 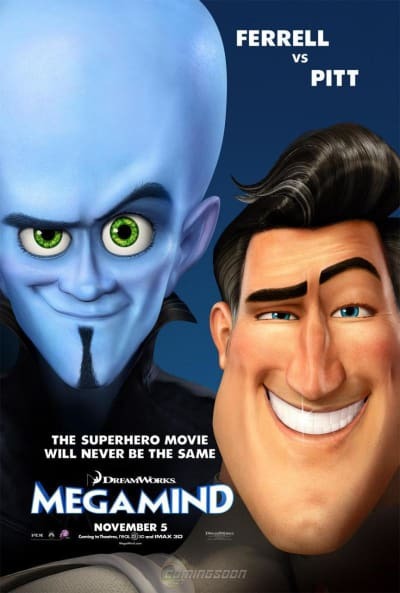 “Megamind” is the most brilliant supervillain the world has ever known. And the least successful. Over the years, he has tried to conquer Metro City in every imaginable way. Each attempt, a colossal failure thanks to the caped superhero known as “Metro Man,” an invincible hero until the day Megamind actually kills him in the throes of one of his botched evil plans. Suddenly, Megamind has no purpose. A supervillain without a superhero. He realizes that achieving his life’s ambition is the worst thing that ever happened to him. Megamind decides that the only way out of his rut is to create a new hero opponent called “Titan”, who promises to be bigger, better and stronger than Metro Man ever was. Pretty quickly Titan starts to think it’s much more fun to be a villain than a good guy . Except Titan doesn’t just want to rule the world, he wants to destroy it. Now, Megamind must decide: can he defeat his own diabolical creation? Can the world’s smartest man make the smart decision for once? Can the evil genius become the unlikely hero of his own story?